Have you ever tried knitting before? I'm not very good at knitting, so I was hesitant to try loom knitting. Loom knitting is so much easier than regular knitting! I made this project accidentally, when I was trying to make a kid's hat but the loom I used was too small. I love this wine sleeve because its reusable. I always am bringing wine for dinner parties, but never know how to present it to the host. This wine sleeve is one of my favorite ways to present wine anything that comes in a cylindrical container. Not only is is very personal, it also is green, and can be reused by the receiver. There are tons of great tutorials on youtube for loom knitting. I used a 5.5 inch loom that I received from ConsumerCrafts.com, you can also purchase the loom from amazon. 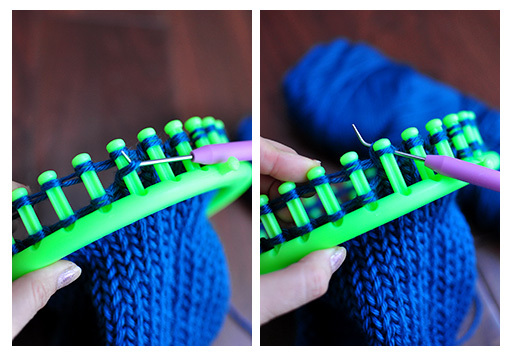 The basic steps for loom knitting is wrapping the yarn around each peg and the using the loom hook bringing the yarn over. I doubled up the yarn to give a fuller look. Here is the amost finished loom. The hardest part on loom knitting is ending the project. 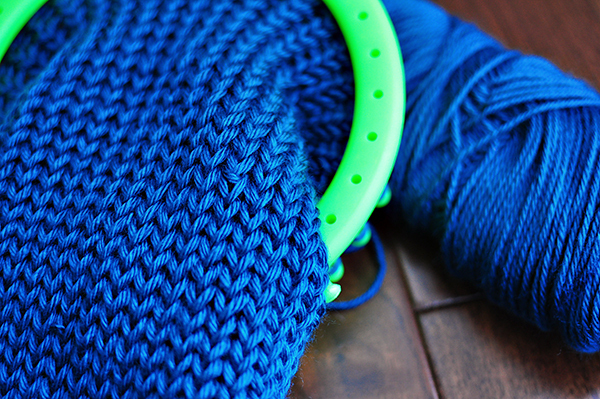 There are a few ways to finish/ cast off the yarn, this is one tutorial that I like. To personalize the wine wrapping I used my favorite rubber stamps to stamp a sign and stamped onto a ribbon a "please reuse me" sign. 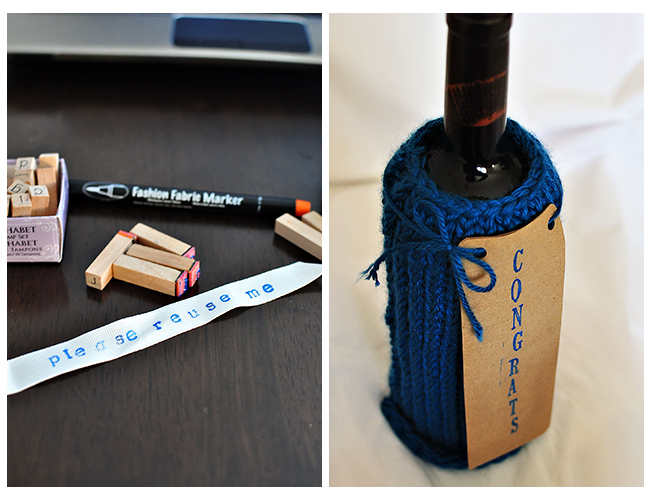 Stitch label onto the back of the wine sleeve. 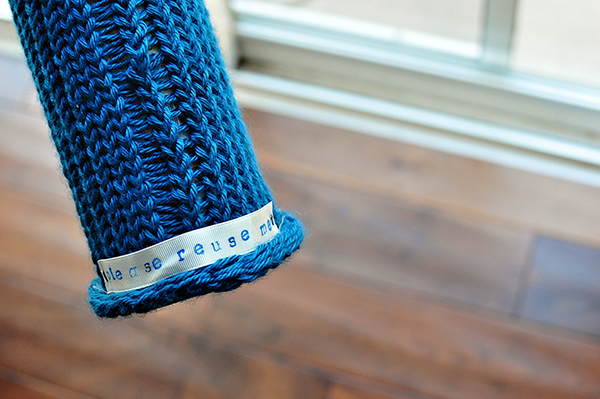 You could also use this sleeve for a mason jar. 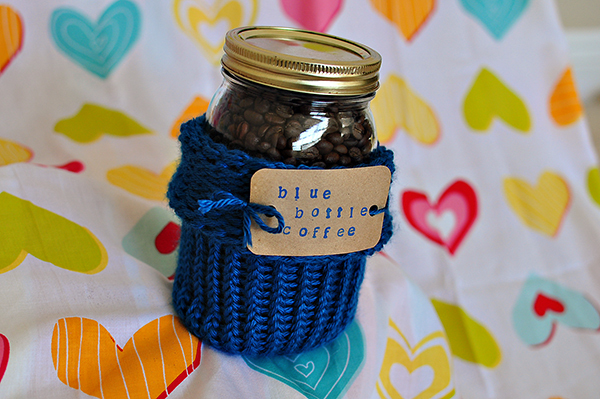 I filled this one with Blue Bottle Coffee Beans (world's best coffee). So cute! I didn't know loom knitting really worked. FYI I've been a fan of your blog for a year now. Keep up the good work! A few of my girlfriends are getting into loom knitting. I've thought about it myself but didn't know what I would make with it and this is such a terrific idea. I just might have to learn a new hobby for future gift giving!